Framed: One of Graciela Iturbide’s works. The 25th Devnandan Ubhayaker Yuva Sangeet Utsav, which will be held at the Chowdiah Memorial Hall, will have three sessions. The festival will feature young Hindustani and Carnatic classical musicians, including violinist Ambi Subramaniam, flautist S. Akash, vocalists Meeta Pandit and Debpriya Adhikary, dhrupad artiste F. Wasifudin Dagar, sarod player Debanjan Bhattacharjee and sitar player Samanwaya Sarkar. Engineer Mokshagundam Visvesvaraya’s automatic sluice gates, first designed as a system to prevent the wastage of monsoon water at Lake Fife in Khadakvasla during 1901-03 were replicated all over the world, including the Panama Canal. Learn about Visvesvaraya’s contributions to the state and the country at this exhibition, which includes photographs, artefacts related to his life, and original archival material. 10am-6pm. Visvesvaraya Industrial and Technological Museum, next to Cubbon Park Police Station, Kasturba Road. Entry, Rss20 for the general public and Rs10 for students. For details, call 22864009. 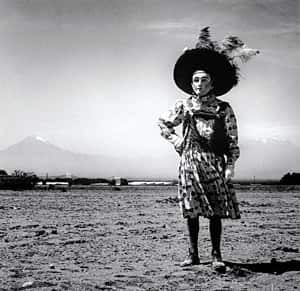 An exhibition of works by Graciela Iturbide, the veteran Mexican photographer known for her black and white takes on indigenous cultures and everyday life in Mexico City and on the Mexican/American frontier, apart from her efforts in support of feminist causes. Key Tumi? is a soliloquy based on Rabindranath Tagore’s sister-in-law Kadambari Devi, who exerted a great influence on him. The soliloquy unfolds as a fictional open letter from Kadambari Devi to Tagore. The text, narrated by actor Sharmila Tagore, is interspersed at various dramatically appropriate moments with songs rendered by Lopamudra Mitra and Paromita Bandopadhyay. Cast: Sharmila Tagore. Writer-director: Amit Ranjan Biswas. 2 hours. This year’s edition of the annual international travelling festival of films and documentaries based on the theme of water was inaugurated on 25 August by singer Vasundhara Das. The festival, co-hosted by the Bangalore Film Society and local academic and socio-cultural institutions, includes screenings across venues such as the Alliance Française de Bangalore, YWCA Koramangala and Jawahar Bal Bhavan. All the films have English subtitles. The Ayya Art Gallery is hosting a solo show of artist Maruthi Paila from Andhra Pradesh. The show includes a series of abstract works in acrylic on canvas. Paila has a bachelor’s degree in fine arts from the Jawaharlal Nehru Technological University in Hyderabad—this is her second solo show in Chennai. 11am-7pm. Ayya Art Gallery, Woods Road, Mount Road. For details, call 9841076654 or 9841037810. A collection of 21 short plays will be performed as part of the annual Sri Parthasarthy Swami Sabha drama festival. Some of the plays that will be staged are Neengale Sollunga, Karuppu Aadugal, Madhil Mel Madhu and Periya Thambi. 7pm. Mylapore Fine Arts Club, Musiri Subramaniam Salai, Mylapore. Donor passes, Rs500. For details and the schedule,call 9444226915. Paprika, the Indian cuisine restaurant at the Courtyard by Marriott, is hosting a kebab festival. On the menu are signature kebabs like Dhingri Khasta Seekh, Golconda Kebab and Murg Tarasse. 7-11.30pm. Paprika, Courtyard by Marriott, Mount Road. Charges, approx. Rs375 (vegetarian) and Rs475 (non-vegetarian), plus taxes. For details and reservations, call 66764000. Alliance Française de Madras, in association with the French embassy, is hosting a reading of French author Yann Kerninon’s latest book on bourgeois and anti-bourgeois themes, ‘An Attempt to Assassinate My Inner Bourgeois’, followed by a screening of his film, ‘Coup de Bordure’ and a discussion with him. 5.30pm. Alliance Française de Madras , No. 24, College Road, Nungambakkam (28279803/28271477). The University of Delhi’s Sukrita Paul Kumar and freelance writer Suresh Kohli will discuss the meaning, scope and significance of the writings of Qurratulain Hyder. In her magnum opus,River of Fire, Hyder or Annie Appa, as she is fondly called, is at her best. She spreads a vastcanvas to paint on, starting with Chandragupta Maurya and his minister Chanakya, moving on to conflicts between established Buddhism and resurgentHinduism, the advent of Islam, the establishment of Muslimdynasties, the arrival of European traders and finally, Partition and the post-independence era upto 1956. 6.30pm. India International Centre, 40, Max Mueller Marg, Lodhi Estate. For details, call 24619431. Organized by the Pandit Chatur Lal Memorial Society, the Amar Jyoti Hindustani classical concert is dedicated to former prime minister Rajiv Gandhi. Flautist Pandit Hariprasad Chaurasia and vocalist Pandit Chhannulal Mishra, accompanied by RamKumar Mishra, will perform. Pandit Chatur Lal was one of the first tabla players to leave his mark on the West. To preserve the legacy of the tabla wizard, his son Charanjit Chatur Lal founded the society in 1990. Past Amar Jyoti concertshave included a jugalbandi bythe late Ustad Bismillah Khanon shehnai and Ustad AmjadAli Khan on sarod, PanditShivkumar Sharma, and even aperformance by Louis Banks. Video, 20-20A, Khan Market (24690134). Fordetails, call 9953246500. M. Sayeed Alam is finally giving his plays on Ghalib a break. This tongue-in-cheek comedy on the trials and tribulations of staging a play returns this Tuesday. J.K. (Harish Chhabra, in an over-the-top yet effective performance), a harassed and hot-tempered director, is trying very hard to get his bunch of actors to, well, act. A week from the performance, the play seems to be doomed—everything that could go wrong does. 1 hour, 45 minutes. 7.30pm. Shri Ram Centre, 4, Safdar Hashmi Marg, Mandi House. Tickets, Rs200, Rs300 and Rs500, available at the venue and atin.bookmyshow.com. For telebooking, call 9810255291. For more details, call 23714307. Home spun: An exhibition of works curated by Girish Shahane. 11am-7pm (Tuesday-Sunday). Devi Art Foundation, Sirpur House, Plot No. 39, Sector 44, behind Epicentre, Gurgaon. For details, call 0124-4888111, extension 177. In Japan, two nuclear power plants, Fugen in the Fukui Prefecture and Tokai in the Ibaraki Prefecture, are in the process of being dismantled. The 60-minute documentary, Dismantling Nuclear Power Plants, produced before the Fukushima Daiichi accident in April, shows a number of functioning and decommissioned nuclear power plants around the world. The film examines the problem of what to do with decommissioned plants and nuclear waste and, as in the case of Fukushima Daiichi, how to clean up after a nuclear disaster. 5.30pm. Goethe-Zentrum, Hill Fort Road, Nampally (65526443). This painting exhibition by Indian Forest Service officer M. Lokeswara Rao uses, among other mediums, acrylic on canvas and acrylic on paper—in all, around 75 works are on show. The themes centre on zodiac signs, Ganesh and Buddha. 11am-7pm. State Gallery of Fine Arts, Road No. 1, Kavuri Hills, Madhapur. For details, call 9963026733. Savour delicacies such as ‘haleem’ and ‘paya shorba’, especially prepared for the holy month of Ramzan, at a sumptuous night buffet at The Golkonda Hotel’s world cuisine restaurant, Melange. 11pm-2am (Monday-Friday), 8pm-2am (Saturday-Sunday). Melange restaurant, The Golkonda Hotel, Masab Tank (66110101). Charges, Rs475, plus taxes. Theatre group Sayak presents Gyan Briksher Phal, based on Leo Tolstoy’s play The Fruits of Enlightenment. This satirical work is set in early 20th century Bengal. The decadent babu culture, feudal lords and flamboyant remnants of the Young Bengal movement form the backdrop of the play. Playwright: Chandan Sen. Director: Meghnad Bhattacharya. 2 hours, 15 minutes. 6.30pm. Academy of Fine Arts, 2, Cathedral Road (9836067788). Tickets, Rs20, Rs40 and Rs60. The East Zone Cultural Centre and ITC Sangeet Research Academy will present two evenings of Hindustani classical music evoking the rain. On the first day, there will be a dhrupad performance by vocalist Uday Bhawalkar and rudra veena player Ustad Bahauddin Dagar, accompanied by Sukhad Munde on pakhawaj. There will also be a performance by vocalist Falguni Mitra, accompanied by Apurbalal Manna on pakhawaj and Rupashree Bhattacharya on harmonium. On Day 2, ITC Sangeet Research Academy scholars will perform, along with vocalists Pandit Ulhas Kashalkar and Pandit Ajoy Chakrabarty. 6pm. Mahanayak Uttam Manch, Monohar Pukur Road, near Basusree Cinema. Children below 8 not allowed. For passes, call 23773395. 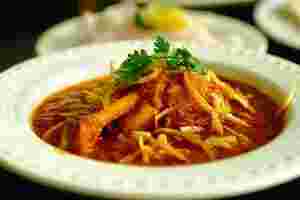 Parsi flavours: Tuck into the sumptuous food at ITC Sonar. 7-11.45pm (buffet only). Eden Pavilion, ITC Sonar. Charges, Rs1,500 per person, plus taxes. Ivory Kitchen is presenting a special kebab promotion with wine and beer. The spread includes vegetarian and non-vegetarian dishes such as Paneer Khush Amdeed, Mumbai ke Khas Aloo and Gulfaroz Jalpari and Didare Gosht ki Chilman. 12.30-3pm and 7-11pm. Ivory Kitchen, 22, Camac Street (22811313). Charges, Rs1,500 for a meal for two, plus taxes. The ongoing theatre festival is dedicated to Rabindranath Tagore, and features productions by groups from India and abroad. On Friday, watch ‘Shesher Kabita’, by Bangladesh-based director Nuna Afroz. ‘Streer Patra’ by Tripura’s Sanjoy Kar will be staged on 27 August. On 28 August, watch Goutam Halder’s ‘Rakta Karabi’ and Swatilekha Sengupta’s ‘Amar Rabindranath’. Seema Biswas will give a solo performance of Tagore’s ‘Streer Patra’ on 29 August. Tagore’s ‘Chaturanga’, produced by Purba Paschim, will be staged on 30 August. Stand-up act: Vir Das will present his unique take on history. History of India: VIRitten will not force you to stifle a yawn. It promises to be a show by “a historian as twisted as your history", who will mix fact and fiction to cover everything from “Harappa to Hadippa, and the British Raj, right up to the Raj and Simrans". Comedians Kavi Shastri and Vir Das take centre stage. 1 hour, 45 minutes. 7.30pm. Sivaswamy Auditorium, The Fine Arts Society, Fine Arts Chowk, RC Marg, Chembur. Tickets, Rs300, Rs500, Rs750, Rs1,000 and Rs1,500, available at in.bookmyshow.com and at the venue. For details, call 25222988. Sandeep Mukherjee’s artworks are hard to categorize. In his deft hands, Duralene—a smooth, translucent, paper-like film—turns into a drawing, painting and sculpture, all rolled into one. To achieve this hybrid effect, Mukherjee applies paint on the surface and creates a relief emboss effect with a blunt needle. The US-based artist’s recent experiments with the medium are on display at his first solo show in Mumbai. While looking at his large hypnotic abstracts—the highlight of the show is an eight-panel, 55ft work—it is easy to think of the lines and spirals as references to astronomical, topographical or microscopic phenomena. The National Centre for the Performing Arts (NCPA) is celebrating the 75th anniversary of one of India’s oldest surviving dance institutes, Kalakshetra. On Friday, the institute’s current director Leela Samson, a former student herself, will talk about the major concerns in the field of dance today, including government policies. On Saturday, Kalakshetra students will present Spanda, choreographed by Samson. Samson will give a solo performance too. 3pm (Friday) and 7pm (Saturday). NCPA, NCPA Marg, near Hilton Towers, Nariman Point. Tickets, Rs300, Rs400 and Rs500, for Saturday’s event available at in.bookmyshow.com and at the venue. For details, call 66223737. Iconoclast : M.F. 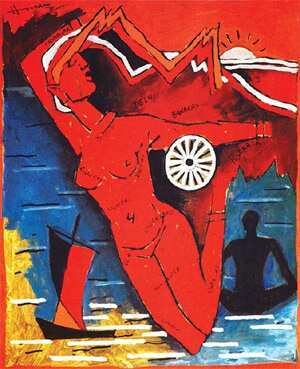 Husain’s works will be discussed by Ranjit Hoskote, Jitish Kallat and Gieve Patel. 7pm. Arbour AV Space, Karim Chambers, First floor, Ambalal Doshi Marg, near Bombay Stock Exchange, Fort. For details, call 22652505. Chennai film-maker Leena Manimekalai is best known for her documentaries, so it’s not surprising that elements of non-fiction permeate her first feature film ‘Sengadal’ (‘The Dead Sea’). Set in a period when the Sri Lankan civil war was still on, the film mixes documentary and fiction, taking a self-consciously art house approach to the issues faced by fisherfolk in Tamil Nadu. Manimekalai fictionalizes the experiences of fishermen and their families, portraying them as living in a state of fear and uncertainty due to the suspicion of authorities and subsequent harassment. Manimekalai shot ‘Sengadal’ on location in Rameswaram with members of the fishing community and refugees. The screening is being organized by the Vikalp Film Archive. 1 hour, 42 minutes. 7pm. Prithvi House, opposite Prithvi Theatre, Janki Kutir, Juhu Church Road, Vile Parle. For details, visit www.prithvitheatre.org, or call 26149546.